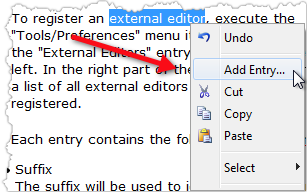 To avoid losing changes, documents are now always marked ‘dirty’ for modifications done in the HTML code editor. The hang during HTML export (due to multiple resources having the same name) is fixed. A problem in the library s7rmtctrl.jar for the remote control of Helen via RMI (Remote Method Invocation) is fixed. In exported PDF files the and tags are displayed correctly. An install package without JRE is also available. 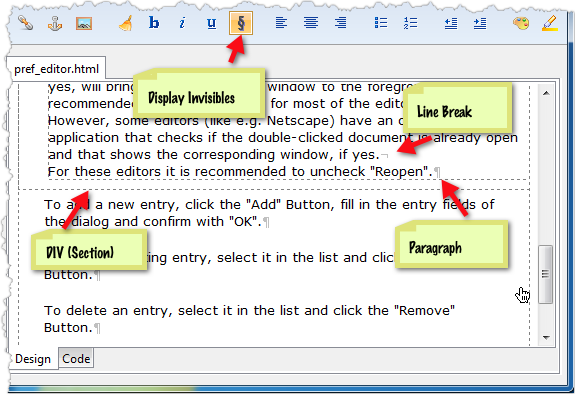 In WYSIWYG design view you can add selected words to TOC, index, and map by using the context menu item ‘Add Entry…’. A dialog opens where you can control the entries for TOC, index and map. In the ComboBox for the map items all entries referencing the edited HTML topic are shown. If desired, the entries can be edited in the ComboBox to create a completely new entry to the map file. If an anchor is specified, the selected text is marked with this anchor and the map item references exact this position. If the cursor was on a link during a switch from WYSIWYG design view to code view, the link was split. Occasionally the preview application was not shutdown completely. The CSS code editor sometimes threw an exception with specific CSS content. tags, it was not possible in the table editor to add rows.